Last night, I was looking for a particular pair of shoes and could not find them because I have been mistreating my closet for several months now. If Hoarders was a closet, you would find it in my bedroom. Utter destruction. Total embarrassment. The problem is that I have too many clothes. It all starts there. How can there be any order when there isn’t enough space to fit it all? That isn’t logical, right? Well, we plan on heading to Ikea later this month and hopefully, solve this issue soon enough. For now, I’m looking for quick fixes and smart purchases to help with my organizational woes. Introducing the Tote Hanger. This is the perfect way for me to organize my bags in an orderly fashion. Right now, they are thrown anywhere and everywhere. They are packed sky high and about ready to tumble. They are under my bed and on top of my dresser. Do you see what I am saying? Disaster!! I need these hangers!! They come in a pack of 6 which means I will need to buy a few to get situated, but I am someone who likes direction and now I feel like I have a good path to walk. 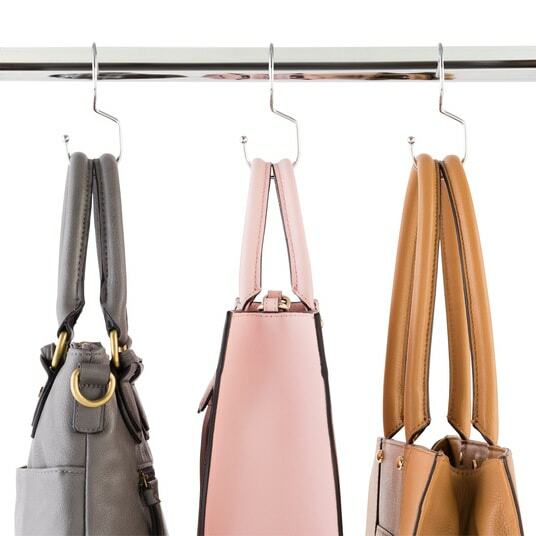 How do you organize your purses and totes? Would love to hear!